Julie Angus grew up a first-generation Canadian with a Syrian father. She had visited Syria only once before, 25 years earlier when she was a child, and now she found herself fascinated by her extended Arab family history, particularly the fact that they had been growing olive trees for hundreds of years. As she learned more and more about the historical and cultural importance of the olive in the Middle East and throughout the Mediterranean, she decided that she wanted to explore its evolution by retracing the original trading routes of the Phoenicians, likely the first people to bring olives and olive oil to Europe — and because adventuring is what the Anguses do best, Julie and Colin decided to sail the Mediterranean, this despite the fact that Julie had never sailed before, and, oh right, they’d also be bringing along their 10-month old son, Leif. Readers who are not familiar with Julie and Colin Angus should know that they are certified (and perhaps certifiable) adventurers: Colin travelled both the Amazon and Yenisey (Siberia) rivers from source to sea as depicted in his first two books, Amazon Extreme (2004) and Lost in Mongolia (2003), and then set out to become the first person to circumnavigate the globe under human power only, a feat he accomplished over two years (2004-06). 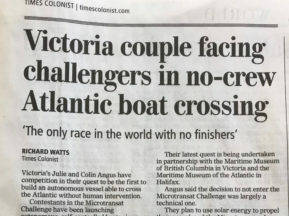 They met at a travelogue that Colin hosted in Vancouver before his round-the-world trip, and Julie eventually joined him on the Moscow-to-Vancouver leg, becoming the first woman to row across the Atlantic Ocean, as described in her first book, Rowboat in a Hurricane (2008), and Colin’s third, Beyond the Horizon (2008). 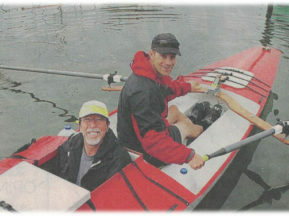 Next, the couple teamed up to co-write Rowed Trip: From Scotland to Syria by Oar (2009), describing that seven-month, 7,000-kilometre effort. 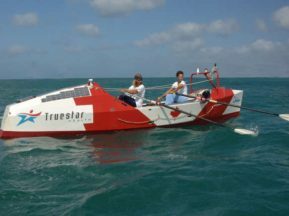 The Olive Odyssey expedition was Julie’s brainchild, related to her background as a scientist — she has a graduate degree in molecular biology and spent more than a decade studying and developing treatments for heart disease, cancer and genetic ailments before joining up for a life of adventure with Colin. Her training and scientific knowledge helped her understand the cutting-edge research around genetic testing being conducted to determine when and where olive tree domestication began. Olive Odyssey describes the journey the Anguses undertook from August to December 2011 to better understand olive trees and olive oil in the past and present. 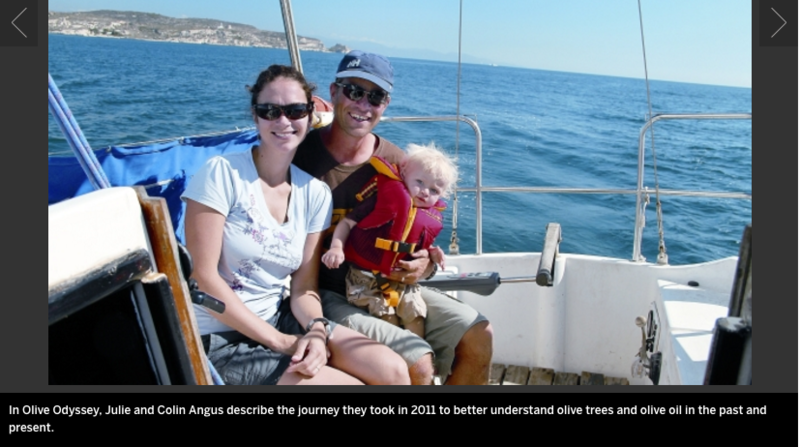 They first visited olive farms and research centres in Spain and France, exploring the coastline there for remote places where wild olive trees might be found, and taking samples from any old trees they discovered. Then they travelled on to Corsica, Sardinia, Italy, Greece, Israel and the Palestinian Territories. Unfortunately, they were not able to end their expedition in Syria as they originally hoped because of the civil war there. The book is successful on many levels. First, it is a deeply informative biography of the olive, a versatile fruit that has played a huge role in the history and development of civilization. Originally cultivated 8,000 years ago, olives were a commodity that drove the economy of the world’s first great civilizations, including the Phoenicians, Greeks and Romans. Olive oil was food, medicine, fuel for lamps, and lubricant for machinery. It still plays a huge role in the Mediterranean economy, much more so than most North American readers will know. Olive Odyssey is also a beautifully written travelogue, describing in enticing detail some lesser known places along the Mediterranean coastlines of Spain and France, the islands of Corsica and Sardinia, and Greece. 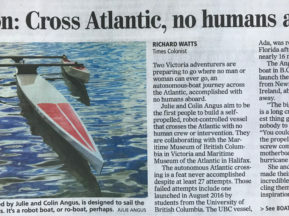 Angus writes with an engaging narrative voice, often sharing personal thoughts and emotions as she and her family encounter challenges along the way, including first finding a suitable sailboat to buy and then dealing with breakdowns, disruptions to their plans due to weather, and communication problems in many of the relatively remote places they visit. As well, readers with young children will easily relate to the additional challenge of travelling with a colicky child. Although this book contains a significant amount of scientific and historical information, Angus manages to keep those sections from becoming too dry and factual by filtering much of this important material through narrative scenes — visits to olive tree science labs in Spain, France and Greece, for example. The personalities of the scientists and farmers they meet come through clearly, and their passion for the olive — past, present and future — is palpable. Speaking of passion, the author’s passion for food is clearly apparent thanks to mouth-watering descriptions of amazing meals featuring olives and olive oil that the Anguses enjoyed on this journey. She even includes some recipes and recommendations for how to host an olive oil tasting party at the back of the book. This is one of those books that will have you thinking, “I had no idea,” over and over again. It will answer all of the questions you might have about olives and olive oil and many more beyond, teach you how to taste olive oil properly, and undoubtedly send you on your own odyssey in search of olive oil varietals offering flavours beyond the usual bland supermarket fare. Olive Odyssey will be launched Saturday, May 10 at 2 p.m. at Barbara-Jo’s Books to Cooks, 1740 West 2nd Ave.